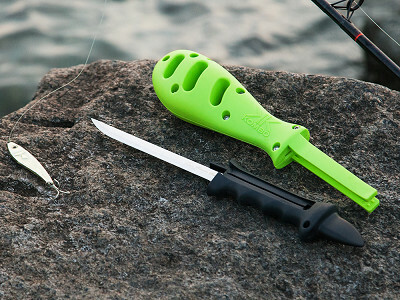 With Kombo’s fishing multi-tool, the slippery task of filleting a freshly caught fish becomes a lot easier. (Certainly a lot easier than catching a fish is.) Tucked inside is a Japanese stainless steel knife with a built-in sharpener. On the handle, the scooper makes gutting and cleaning easier. When you’re done, safely sheathe the knife back into its weighted case, which becomes a “bonker.” This makes it a heavy implement you can use to humanely shorten your fish’s flopping. It’s a perfect gift for any avid angler, but surprisingly, it wasn’t invented by one. Instead, Ryan Jesse left behind a painting career to pursue life as an inventor. This fish fillet knife isn’t his first effort, but with it, he seems to have landed a big one. This simple idea “komboed” his ingenuity and his passion for the ocean. 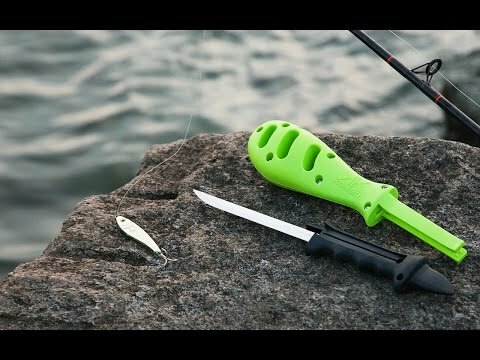 Unlike pretty much every other aspect of fishing, this fishing tool is easy to grip, thanks to its thermoplastic rubber handle. And if you happen to drop it in the water, don’t worry… because it floats. Clean and fillet with one simple, safe, effective tool. Enjoying fresh fish is easier than ever. 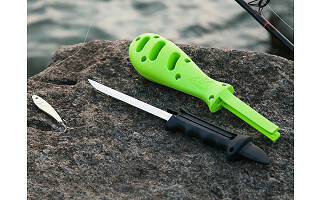 We're excited to bring our multi-functional fishing tool to The Grommet! Please let us know if you have any questions about the design, fishing, or anything at all. I'm curious...how long is the blade on the knife? Is their a de-scaler feature as well? @Steven Oops...there. Now I've got it. @Steven Thanks for the question! the blade is 7 Inches, No there is no de-scaler, but that's is an interesting idea for the next one. @William did you have a question? @William I usually skin my fish but the ones I don't , I've used the back side of my knife (NOT the sharp side) or the spoon works also. I'm from Alaska and catch a lot of fish ! @William Totally a good point! Is the sharpener ceramic? Also would be great if it had a descaler as part of this cool Grommet. I hope you offer it in the future. does the knife still float if it's not in the case? @Laurie the tool is meant to float as a whole, so unfortunately no, the knife does not float alone. It is made of Thermo Plastic Rubber for maximum grip which is not a floatable material. We figured more grip, less chance of people dropping it. It would almost be great if the knife could reverse into the floating grip, so if you did drop it, you can retrieve the entire thing. @MJ not exactly sure what you mean, Do you mean if the handle of the knife fit into the "Bonker"? Sorry, yes the handle. Or something like that. Is there a way to attach it to your belt or any sort of lanyard? @Robert there is a lanyard hole in the handle to add one! @Mike Sorry to hear that Mike, we only use the highest quality materials we can!, We had looked into getting it made in Canada and the USA, but the price was too high. We want to make our tool accessible to everyone. Ryan, the Founder, has been to the factory numerous times, and has nothing but praise for those making our tool! Fishing & Bushcraft Tools Should Not Be Made Of 3CR13 CHINESE Steel. You Claim Your Fillet Knife Is JAPANESE Steel Which Is Rated From AUS-6, AUS-8 And AUS-10. This Knife Is In No Way JAPANESE Steel, Your Ad Says It's Made In CHINA. AUS-8 JAPANESE Steel Is Far Superior To 3CR13 CHINESE Steel Which Is the USA Steel Comparison Of 420 Stainless Steel. The USA Steel That Should Be Used To Make A Good Fillet Knife Is USA CPM154 Stainless Steel With Rockwell Hardness About 61 Towards The Knife Tip. By The Way Anyone Who Wants A Fish Scaler On Their Knife Doesn’t Know The First Thing About Cleaning Fish And Should Avoid Handling Cleaning Fish. @Ross G. We sourced Japanese steel from our factory, which yes, is in China, but thanks for the very detailed information. @Lynnette great questions! the Bonker is weighted for killing the fish quickly. But we have created sealed off air chambers inside making if float in spite of those weights. That is exactly how the spoon works, most people just use their fingers to clean out that spine area, our tool is shaped in a way that gets rid of that mess in no time, just run it along the spine. You have a fish on your hand and the knife you are trying to sell on the other. Why on the earth you did not show us the "usefulness" of the knife by cut fillet the darn fish!? @Scott we were trying to be sensitive to the animal lovers out there. The cutting of a fish for a public site could be seen as too graphic. So we try to let people put two and two together. If you want to see an example of the Knife cutting, follow us on YouTube, we have a full Filleting video. Hi Scott, exactly what Amber said. You'll just have to take us at our word that a 7" stainless steel knife will do the trick! Growing up on the Chesapeake Bay, I have been a fisherman all of my life (I am 60 years old). I must say that, while this is a novel idea, there are simply too many high quality fillet knives available for around 3o bucks. The fish "bonker" feature is actually funny. In all of my years of fishing, I have never seen a single fisherman "humanely bonk" a fish before cleaning it. Scientists have long determined that fish do not have the neuro-physiological capacity for a conscious awareness of pain. The "scooper" is funny as well. If someone does not want to get their hands messy cleaning fish, perhaps they should not be fishing in the first place. A fish scaler would have been a more appropriate feature to make this a combo tool. Even with all of that said, I would still throw one in my freshwater tackle box just to have, but not at 30 bucks. When I look at this tool, it shouts $19.99 all day long. Sorry. Just keeping it real. Tucked inside is a Japanese stainless steel knife with a built-in sharpener. On the handle, the scooper makes gutting and cleaning easier. When you’re done, safely sheathe the knife back into its weighted case, which becomes a “bonker.” This makes it a heavy implement you can use to humanely shorten your fish’s flopping. It’s a perfect gift for any avid angler, but surprisingly, it wasn’t invented by one. 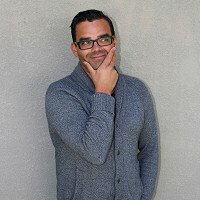 Instead, Ryan Jesse left behind a painting career to pursue life as an inventor. This fish fillet knife isn’t his first effort, but with it, he seems to have landed a big one. This simple idea “komboed” his ingenuity and his passion for the ocean.